What a difference a day makes. 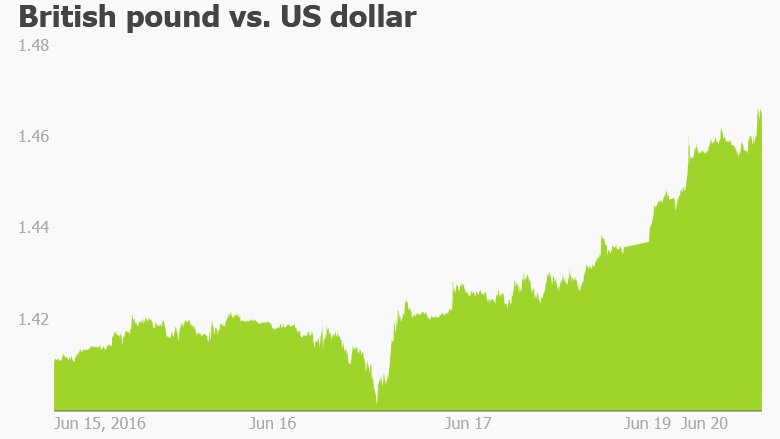 The pound is seeing its biggest gains in months after taking a beating last week. 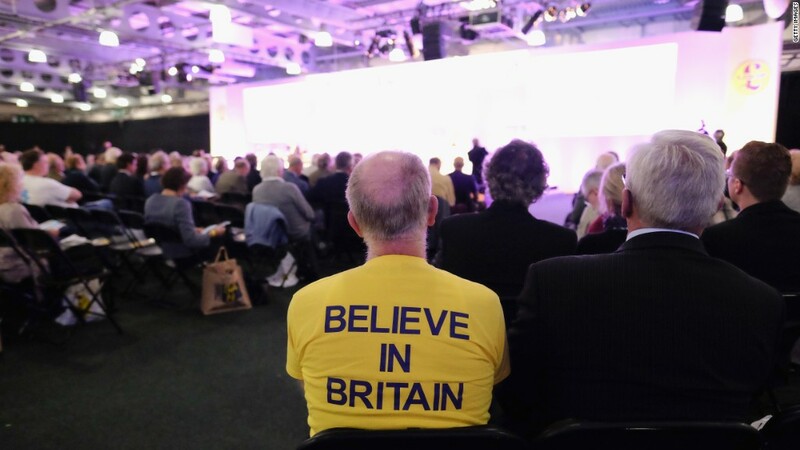 The stunning rally Monday follows a series of opinion polls suggesting that more U.K. voters are being swayed to vote to remain in the European Union during a historic referendum on Thursday. The split is now roughly 50-50. Support for a vote to leave -- or Brexit -- was slightly ahead last week. But the polls are volatile, and many people have yet to make up their minds with three days of campaigning left. "They think it's all over (it isn't, yet)," commented Kit Juckes, strategist at Societe Generale on the market reaction. "The market will surely gyrate some more in the next few days as any shift in that position triggers an exaggerated reaction," he added. The U.K. currency gained about 2% versus the U.S. dollar to trade around $1.46, and it's up versus all other major world currencies. It fell as low as $1.40 last week. Economists have been warning for months that a vote in favor of Brexit would do lasting damage to the British economy and could reverberate throughout Europe. Those in favor of leaving argue they want to break free from EU political interference and regulation, and take more control of U.K. immigration. They argue an exit from the EU would boost the British economy. Campaigning was suspended from Thursday through Saturday following the murder of British lawmaker Jo Cox. "The campaign to stay in the EU seems to have regained a little momentum, partly before and partly after the horrific murder of Jo Cox," said Holger Schmieding, chief economist at Berenberg bank. Cox had supported the campaign to remain in the EU. Tommy Mair is accused of killing Cox in an attack on a street in northern England. She was stabbed and shot. During the attack, Mair was heard to say words to the effect of "Britain first, keep Britain independent, Britain always comes first, this is for Britain," prosecutor David Cawthorne said Saturday, citing witness accounts. When asked his name during courtroom proceedings, Mair said: "My name is death to traitors, freedom for Britain."